Athens, Hocking, Vinton, Jackson, Meigs, and Gallia counties. Raccoon Creek discharges into the Ohio River. There are approximately 25,610 acres of underground mines and 21,550 acres of surface mines. This watershed suffers from acid mine drainage as well as pollution from oil and natural gas byproducts, erosion and sedimentation, sewage, and industrial point source pollution. 111 of 119 affected stream miles meet a pH target of 6.5. During the 1980's, a group of concerned citizens in Gallia County joined together to discuss the degraded condition of the creek. 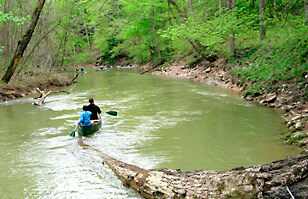 They became the Raccoon Creek Improvement Committee (RCIC), and they dedicated themselves to preserving Raccoon Creek and educating those who live within the watershed. In the 1990's, citizens from all six counties in the Raccoon Creek watershed were invited to join RCIC restoration efforts, initiating a total watershed approach. The Raccoon Creek Partnership was formed in the fall of 2007 after decades of efforts by community members to preserve and improve the health of the stream. Raccoon Creek Partnership (RCP) is a nonprofit group that is run by an elected board of directors and a watershed coordinator who is funded by Ohio University’s Voinovich School. To conduct outreach activities and provide environmental education to the public and watershed partners with regard to Raccoon Creek watershed management. To support and coordinate watershed related research activities. To develop and support stewardship programs to activate and educate the local watershed community. To advocate and support activities that support and further the mission of the RCP.